The Seamaster 2017 ITTF World Tour Qatar Open was brought to a close on Sunday 26th February, as the four senior titles on offer at the first Platinum event of the year were claimed on the final day of the tournament. One of the big questions heading into the final day’s action was whether Ma Long could go on to claim another victory over Fan Zhendong at the Ali Bin Hamad Al Attiyah Arena as the top two male players in the world faced one another in the Men’s Singles final. Last year at the 2016 ITTF World Tour Qatar Open Ma Long saw off Fan Zhendong to lift the Men’s Singles trophy, and the two Chinese players met again in December of last year at the Seamaster Qatar 2016 ITTF World Tour Grand Finals with Ma Long prevailing once again. Now Ma Long has added another important victory over Fan Zhendong in Doha, thundering his way to the Seamaster 2017 ITTF World Tour Qatar Open crown with a 4-2 triumph over the 20-year-old (11-8, 11-8, 11-7, 5-11, 6-11, 11-4). “… It’s my first international event of the year. I won my first title of 2016 in Qatar as well and moved on to win more. I even became the Olympic Champion, so I hope retaining this title in Qatar will be another good start to 2017 for me”, Ma Long. There was more success for China on the closing day of the competition, as Chen Meng leaves Doha with two titles to her name. First up for Chen Meng was the Women’s Doubles event where she partnered up with Wang Manyu for the final. The unseeded duo of Chen Meng and Wang Manyu combined to perfection in the final, as they stunned the no.1 seeds Jeon Jihee and Yang Haeun of Korea Republic across four games (11-4, 11-6, 4-11, 11-6) to seal the title. 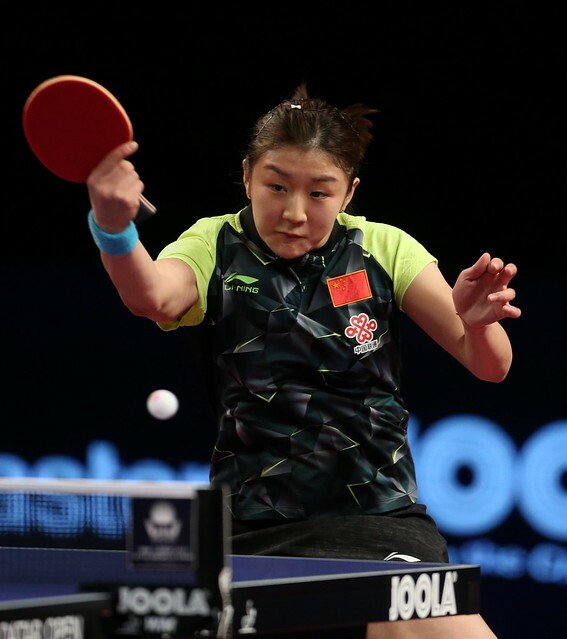 Chen Meng and Wang Manyu may have enjoyed success together, but the two Chinese competitors would soon been standing on opposing ends of the table for the final round of the Women’s Singles competition. Wang Manyu was competing in her first final in the category and impressed for a large portion of the tie, however, she was unable to prevent Chen Meng from capturing her sixth Women’s Singles trophy as the no.9 seed came through the final with a confident display (12-10, 11-9, 11-6, 2-11, 11-6). “We are teammates so we know each other very well, it was a very tough match; especially in the first two games, I only won by a narrow margin of two points in each game, it was tedious mentally as well to take those two games. The first two games were crucial, so after winning those, it was easier for the remaining of the match”, Chen Meng. The other final taking place on the concluding day of the Seamaster 2017 ITTF World Tour Qatar Open came in the Men’s Doubles event as the top seeded pairing of Masataka Morizono and Yuya Oshima reached the top step of the podium. Japan’s Masataka Morizono and Yuya Oshima actually fell a game behind to Sweden’s Kristian Karlsson and Mattias Karlsson in the final, but the no.1 seeds recovered well claiming the next three games in a row to complete the victory (9-11, 11-5, 11-5, 11-9). Masataka Morizono and Yuya Oshima have now won six Men’s Doubles titles from six appearances in ITTF World Tour finals.